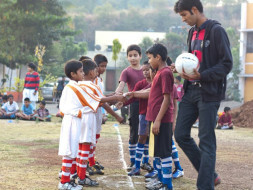 The idea of Just For Kicks was born in our minds in 2011 when we served as teachers in low income schools in Pune, India. As teachers constantly looking to instil a sense of community in our classroom, we turned to football to provide the impetus. Within a few months of kicking off the program, we noticed a positive change in the classroom culture with students working as one unit. Academic performance, classroom behaviour, social skills, attendance rates increased by leaps and bounds. We knew we had a winner here. Having won the Design For Change Award in 2011, the program has now grown to a hundred schools across three cities of India - Pune, Mumbai and Hyderabad. Having been teachers ourselves, we strongly believe in the power of sport in creating a huge impact in the education space. The game becomes a third place to the children - beyond the struggles of home and pressures of School - to express themselves freely and come into their own. At the same time, we also believe that Just For Kicks can serve as a launch pad for some of the hidden talents in our country - a platform our country desperately needs. We identify schools that cater to under resourced communities - both public and private schools - and match them with a coach. The coaches work closely with the teachers and the children to develop teams of 10 each in various divisions (junior, senior, super senior - boys and girls). Coaches train the students using our life skills based football curriculum while working closely with both parents and teachers to build a cohesive culture. Schools which do not have playgrounds are provided access to nearby grounds and students are provided with all the necessary gear to play, as well. The training period spans four months of fall during which the teams play friendlies with other teams from different parts of the cities. In the beginning of Winter, we kick start the league when teams from a cluster play home and away games against the other teams that culminates in a nation wide tournament. During the tournament, we bring in scouts from different parts of the World to watch the talent and potentially provide scholarships for further development. We have partnered with the DSK Liverpool International Football Academy, Huracan Foundation, Teach For India, Tech Mahindra among others to provide the highest quality to every student in our program. You can also be a team owner through a direct donation of USD 200 (INR 12000). You will be matched to a team of your choice and will serve as a mentor to them apart from funding. 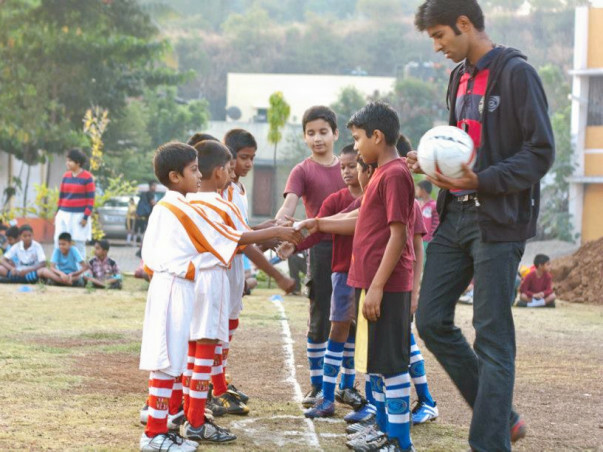 If not an IPL or ISL team, how about owning a kids' team? Thanks for choosing to support Just For Kicks. It has been a long journey for us, going from 4 cities and 1500 kids when we started the campaign to 6 cities and 3000 kids today. We have 93 trained coaches in the system, 14 employees working hard to bring our vision alive, and an equal representation of girls and boys in the program. Feel free to reach out to us if you'd like to receive updates more regularly or in case of any further queries. Thanks for the incredible support you all extended to us last season (2015-16). We set out on a target of 15 lakhs and met it with right before our championships got underway. We conducted 32 sessions on average for each team in the program, totalling to more than 2000 sessions across the year in all our sites. We've taken giant leaps in building the basic life skills among these kids through the sport, thanks to all your support. This last season, we conducted one of the biggest leagues in the country - School Football Championship (www.sfcleague.com) where teams from elite schools were pitted against the teams from JFK. Incidentally, in 4 out of the 10 divisions, our JFK children emerged national champions - something that has proved the power of the sport. We're also happy to announce that 4 kids from our program will be making a trip to Crystal Palace FC, London in August 2016. This is just the beginning of something fantastic - we hope each of you continue to support us this year as well! Wonderful initiative! Would like to sponsor a team from Pune please. Fantastic initiative! All the best.